Ocean-themed mobile slots are slightly more commonplace on the slots market than you might first have anticipated. 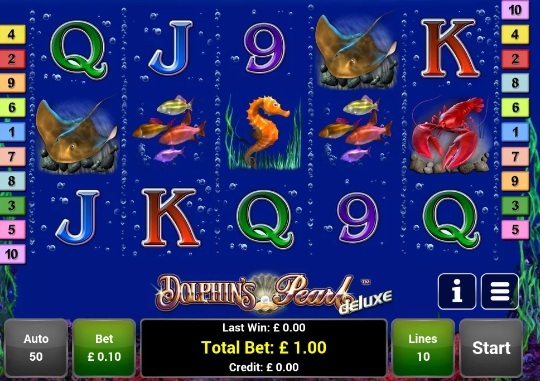 European slots giants Novomatic alone have the Neptune-inspired Lord of the Ocean mobile slot and they also have this Dolphin's Pearl Deluxe mobile slot. 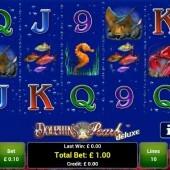 Dolphin's Pearl Deluxe is a 5 reel, 10 payline mobile slot that has its reels set at the bottom of the sea. The symbols on the reels include a variety of fish and sea creatures such as a tropical fish, stingray, lobster, seahorse, and the 9-through-to-Ace symbols. The Wild symbol responsibilities are taken on by the dolphin. This is a game all about the dolphin's pearl after all. The dolphin Wild substitutes for all other symbols, except for the Scatters, to complete winning combinations that might appear on the reels. Any wins involving the Wild will also dish out 2x multipliers. Hit five Wilds across the reels and you will earn 360 coins. Scatters are present on the reels as the title dolphin's pearl. If you manage to get three or more of these little gems across the reels on a single spin then you will trigger the free spins bonus round. If triggered, you will receive 15 free spins with a 3x multiplier attached to any wins you hit during the free spins bonus round. It is also possible to re-trigger the free spins bonus round by hitting three or more Scatters on the reels during a free spin. That is the simplistic beauty of Dolphin's Pearl Deluxe. This is what I would call a perfect starter mobile slot for any players that are new to slots gaming. You have the basic concept of Wilds, Scatters, and free spins without any inclusion of complex bonus features. Novomatic are artists when it comes to creating these kinds of mobile slots and you need look no further than their other titles such as Book of Ra Deluxe mobile slot and Lucky Lady's Charm Deluxe mobile slot to experience the simple joys they can offer in their slots.